NASA Image S70-32726 is a pre-flight photo of the Lens Brush flown on Apollo 13. 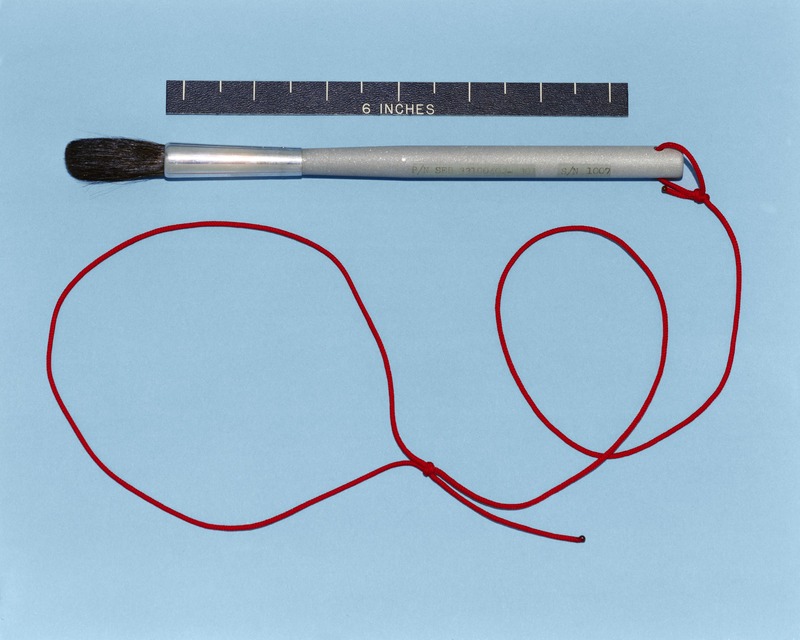 Description of the Lens Brush from NASA's Handbook of Pilot Operational Equipment. Scan courtesy Ulli Lotzmann. 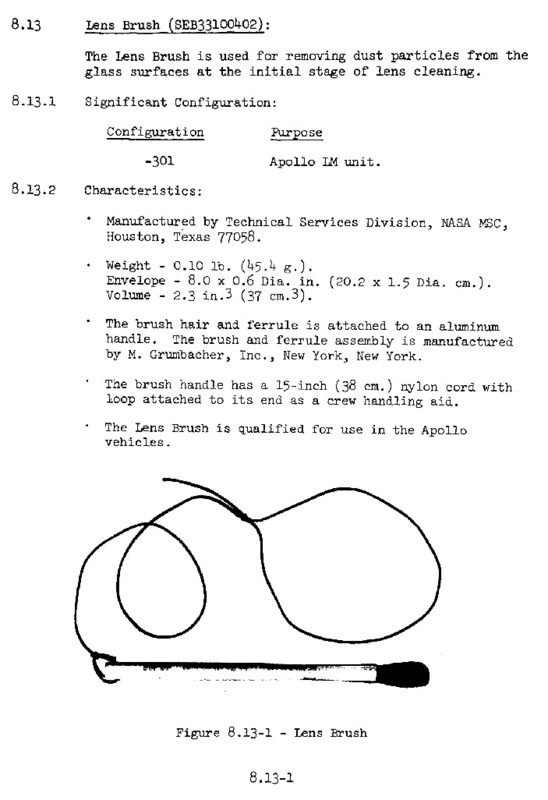 The lens brush was first flown on Apollo 13 and first used on Apollo 14. 142:51:19 Scott: There. Get the lens brush out. Try to take care of those lens. (Pause) Hey, that works pretty good. 142:51:32 Scott: Man, does it ever. Bright and shiny. Al Shepard cleans the TV lens after catching the cable with his foot and toppling the camera. Al uses the lens brush to clean the traverse map after dropping it. "The little dust that accumulated on the modular equipment transporter could easily be removed by brushing. The lunar map collected dust and required brushing or rubbing with a glove to make the map useable." When Ed Fendell pans the TV camera up-Sun, the view degrades because of light scattered off dust on the lens. During the 1991 mission review, Dave Scott commented that a lens cap might have been appropriate. While reviewing the TV at 122:26:09, he commented that Houston should have had them dust the lens. Apollo 15 Station 2 122:41:58 While he and Jim Irwin are examining the Station 2 boulder, Dave suggests that, "We ought to check the dust on the lens of these (Hasselblad) cameras." They don't do so at this time. At 122:46:50 Dave asks Jim, "Is my (Hasselblad) lens too dirty to use?" Jim replies, "I don't see any dust on it at all." At 123:16:17, Jim is about to take a second pan and wonders if there is a lot of dust on his lens. Dave replied, "Didn't look bad, Jim. I just looked at it." They are becoming conscious of the need to examine the camera lenses. Apollo 15 EVA-1 ALSEP deployment 124:32:29 After Dave parks at the ALSEP deployment site and turns on the TV, we see that the lens is dusty. During the 1991 mission review for the ALSJ, Dave again commented that Houston should have told the crew to dust the lens. That won't happen until they reach Station 6, their first EVA-2 geology stop. Dave uses the lens brush to clean the Hasselblad lens: "Hey, that works pretty good ... Bright and shiny ... I'll tell you that lens brush really does the trick." They had not brushed the Hasselblad lenses during EVA-1. The A16 and A17 crews will check their lenses regularly. Apollo 15 Station 6 143:55:47 Shortly after Dave and Jim arrive at Station 6, CapCom Joe Allen asks them to dust the TV lens but then defers the request until 144:41:42, at the end of the Station. Jim will dust both the TV and LCRU a few minutes later, at 144:48:14 just before they leave Station 6. At that time, he uses the big dust brush to clean the LCRU and then uses the lens brush on the TV lens. Fendell gets TV of both. Jim does the TV lens cleaning at about 144:49:43. The improvement in picture quality is significant. Because Jim isn't sure which brush they should use on the TV lens, he asks Dave before doing anything. Apollo 15 Station 7 at Spur Crater 145:32:05 Since the time Jim cleaned the TV lens at Station 6, they have driven only 400-500 meters at low speed. There doesn't appear to be much dust on the TV lens. Joe wants Dave to clean the LCRU and the TV. Dave asks if they want the lens brushed or the mirror on the top. Joe confirms that they want the lens cleaned. "All righty. It takes a couple different brushes. I hate to put this big brush on that lens." Joe replies "You read it correctly." Mention of using the lens brush on the Hasselblad cameras and the TV. Dave said," That lens brush is really a good brush. It cleaned (the TV) off very well." Apollo 15 EVA-3 traverse preparations 164:02:07 Dave and Jim clean each other's Hasselblad lens. Joe requests that they dust the TV lens. We see Dave in the TV record doing the dusting. There was considerable dust on the lens at Station 9, as can be seen in the TV record at 165:02:51. Apollo 15 EVA-3 close-out 167:26:33 Joe tells Dave to take both the large dust brush and the lens brush to the VIP site. The TV camera is getting hot and they hope that brushing the radiator and lens will help. After a fall, Charlie uses the lens brush on the Hasselblad he is using. John is using the other camera and checks that lens. "It looks clean." John uses the lens brush to clean Charlie's Hasselblad lens. (All) John uses the dustbrush - rather than the lens brush - on the TV lens. They stow two lens brushes in the Equipment Transfer Bag (ETB). LRV deployment 117:43:52 Cernan: "Man, I got so much dust over my visor already, I got to wipe it off. Get that lens brush; I want you to dust me off a little later, Jack." Jack is incredulous, thinking that the lens brush is much too small to use on Gene's visor. Capcom Bob Parker hurriedly jumps in to tell them NOT to use the dustbrush or a glove. Jack stows the two lens brushes under Gene's Rover seat. 119:03:39 Gene is about to drive the the ALSEP deployment site and still has a dirty visor. Jack is already out at the ALSEP site, so Gene tries to clean a small part of his visor and only makes matters worse. Evidence in the TV record indicates that he went around to his seat, probably to get a lens brush. While packing the ETB with used film magazines and loose rocks, Jack says, "Let's see. We better take those dust brushes (probably meaning the lens brushes) up there (to the cabin)." This is a sensible departure from the cuff checklist, given how dirty everything got after they lost a fender. Jack puts the lens brushes in the ETB. Cernan: "Bob, how's your TV lens? I don't have a lens brush. It looks good from here. I don't want to use this (big dustbrush) unless you think so." Houston looks at a patch of bright soil to see if the lens is clean enough and decides that it is.